+ Various, APDW, Gramophonedzie & Ben Onono, Alice Francis, Unknown loops, Noze & Riva Starr and more. 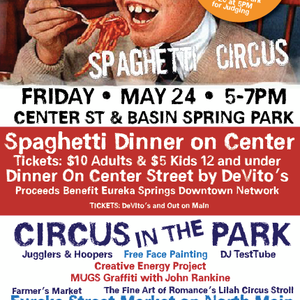 Testube presents Circus Mix 2 - "Freakshow", the second megamix/mashup produced for the Eureka Springs Downtown Network&apos;s "Spaghetti Circus" Event on May 24, 2013. This set features more of an electro/house sound, combined with cabaret, circus-themed and brassy jazz tunes. Special shout out to deejay SHEMIAN for exposing me to a number of the jazzier tracks in this mix! This isn&apos;t my usual style of music when deejaying, and his extensive jazz mixes were an excellent primer for finding new tracks that might fit the theme.